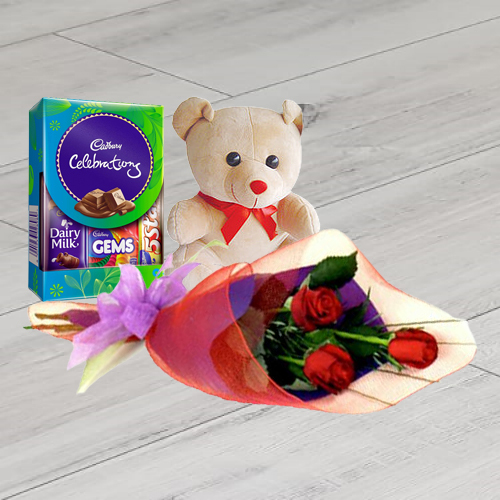 Try out something special by sending this online gift of Robust 3Pcs Red Rose Hand Bunch, 6" Cute Teddy and Cadbury Assortment Mini Pack to your near and dear ones. This slouched Gift Hamper is meant for all occasions bearing the message of true love. Flowers Delivery Nagaur, Send sweets Bombay, Wedding Cake Ajmer, Diwali Mithai Tirupati, Send Flowers and Gifts to Gaziabad, Online Shop Kanpur, Flower to Moga, New Year Flowers Sangli , Fresh Fruits Viruthunager, Send Gift Nawashahar, Dry Fruits to Vasco, Birthday Delivery Vijaywada, Sending to Kottakkal, Flower shop Guwahati, Malappuram Online Cake Delivery.